Yesterday, Oprah paid a surprise visit to the Casa in Abadiania and sat down with Medium Joao for a long interview. 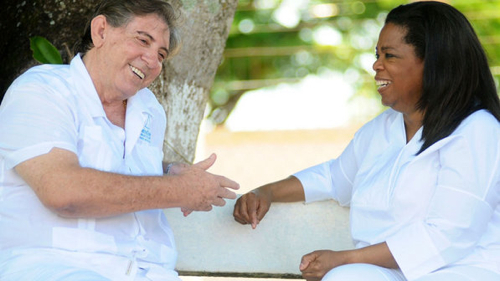 Oprah's primetime TV series, "Oprah's Next Chapter," will feature an episode this summer about her trip to this remote corner of Brazil, her day with world-renowned healer, and her up-close look at the surgeries performed without anesthesia or sterilization. Here's a slide show with pictures of Oprah's visit, a hand-held video (filmed on an iPad) of the behind-the-scenes, and the breaking news story in the Brazilian press. If you are in the United States, Oprah's Next Chapter is on Sundays from 9-10 PM. Please check your local listings.